We all love soccer – but how badly do you want to win? 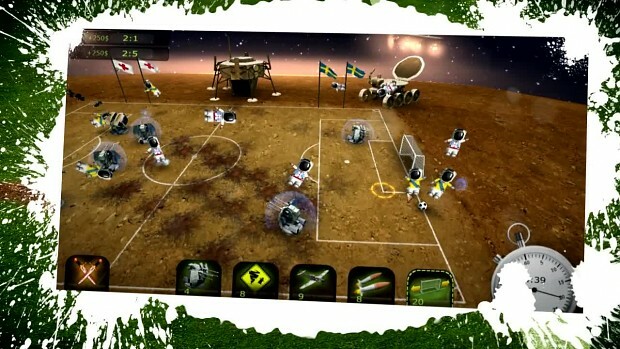 FootLOL lets you use mines, shields, aliens, cows, guns and many more cheats to decimate the opposing team and protect your players. Play against your friends or AI opponents! As a manager, you’ll take your team through a few training matches, before being unleashed on new planets. As you go, you’ll unlock new gadgets, improve your players’ performance, and unlock new kits and hats for them to wear. Opponents often have the same tricks you do so it’s not as simple as knocking the ball in the back of the net. You’ll need to fulfill the conditions for each level – which might mean losing, or fighting your way back from defeat! Thankfully, the addictive action, cute characters and the best arsenal seen in a soccer game since, well, Arsenal make every match too close to call. Once you’ve finished FootLOL’s tournament mode, you can play against the computer or go online for gripping multiplayer! err crazy! i like it.